Belinda Wilkerson on the front porch of her FEMA cottage in Safe Harbor Estates, a new subdivision on high ground in Bayou La Batre, Ala. The house is nice, she says, except for rules preventing her from bringing her oyster skiff along. Four years after Hurricane Katrina, housing is still elusive for some storm victims. In the small fishing villages along the Alabama Gulf Coast, the storm made a hardscrabble life even harder. Even in towns where federal money lures residents to move to higher ground, not everyone wants to go. There are signs of recovery in southwest Alabama, where new homes are being built high on pilings, and thriving shipyards are busy building crew boats to service offshore oil rigs. But venture a little deeper into neighborhoods, and the scars remain. "I get up every morning and look this way," says Stephanie Bosarge, a longtime resident of Coden, Ala. "It's all gone. Everything's changed. That piece of slab there was our den, that's where we had all our Christmases." Bosarge walks through the weeds on her family's property. She still lives just next to where her mother's house and the family's oyster business, Nelson and Sons Seafood, used to stand. "The shop was over here, and as you see, what's left [is] the concrete slab," Bosarge says. "She had nine kids, and the majority of us all worked right back here at one time or other. It was the mainstay for the family." The city of New Orleans is still struggling to recover from Katrina. After 40 years in business, Nelson and Sons was wiped away by Katrina. Kudzu vines now grow over the concrete run where a conveyor belt once carried oysters to be shucked by the shop's 60 employees. The family can't afford to rebuild. There wasn't enough money left after insurance covered outstanding loans. And they haven't been able to qualify for a government loan, which bothers Bosarge. "I've worked all my life. I've paid taxes all my life; my whole family has. I'm sorry — that's my money, too," she says. "This has been a hard-working little area that has never been served. Never asked for anything, never got anything," she says. "It's done nothing but what you see: seafood. And seafood is work." Now Bosarge and her brother, Paul Nelson, advocate for more government help for local storm victims as part of the South Bay Community Alliance. "They look at us today and say, you know, it's four years after a hurricane — what's your problem?" Nelson says. "Well, my problem is [I'm] homeless, jobless and no future. Because we're on our knees and we can't get up." Nelson, a commercial fisherman, also lost his boats. At 58, he says, it's too late to start from the ground up. He complains that he can't even afford to rebuild his home because of new post-hurricane construction requirements. In nearby Bayou La Batre, city officials are hoping strict new codes will help prevent the kind of destruction that Katrina wrought. "It's coming together — sure is. We're the only state on the Gulf Coast that's done the right thing," says Mayor Stanley Wright. A $15.6 million FEMA grant allowed Bayou La Batre to create two new subdivisions — Safe Harbor Estates and Safe Harbor Landing — safely away from the water. Becky Barbour, 54, refuses to move to Safe Harbor, even though city officials say she can't live in her FEMA trailer anymore. She says she doesn't have the money to leave the land she has lived on for 33 years. "And we built 100 FEMA homes out there, on higher ground. That's 82 foot above sea level," Wright said. "Eventually, I'd like to get all the homes in the low-lying areas mitigated out to higher ground, to where we don't have to keep going through this same thing every time." Safe Harbor Estates and Safe Harbor Landing opened last year; there's a waiting list to get in. People still living in FEMA trailers were given priority. They pay 20 percent of their gross income for the first year; after that, they have an option to buy the colorful modular homes lining what used to be a cow pasture. In front of her yellow, four-bedroom cottage, Belinda Wilkerson has planted a garden. There's a bird feeder and day lilies she brought from her home that flooded in Katrina. The mold had gotten too bad for her asthma, Wilkerson says. She's lived here about four months. "The house is nice," Wilkerson said. "The house really is nice. So far." But it's been a hard transition for Wilkerson, whose husband lost his fingers on a shrimp boat shortly after Katrina and is now on disability. They've always lived independently on their own land, she says. Now the neighbors are close, and there are strict rules to follow. Wilkerson couldn't bring her outdoor sheds; she has to pay extra to keep her dog in the yard, and they had to leave their oyster skiff behind. "They said no boats," Wilkerson said. "Couldn't bring no boats out here. We got a fine oyster skiff — it's at my friend's." Asked if a boat in a yard is a normal sight, Wilkerson said, "Should be. Everybody's seafood workers supposed to be." The new subdivision is a stark contrast to the streets around the bayou, where boats are parked in front yards, oyster shells line driveways, and shrimp nets are strung up on the limbs of oak trees to dry. Nearly half of Bayou La Batre's 2,300 residents were left homeless after the storm. Today, there are only two people still living in FEMA trailers, and as city building inspector Tommy Reynoso said, "They bought their trailers. But what we're trying to do is get them to quit living in them." Driving a pickup truck through the neighborhoods, Reynoso pointed out homes that still need to be demolished or raised up on pilings. 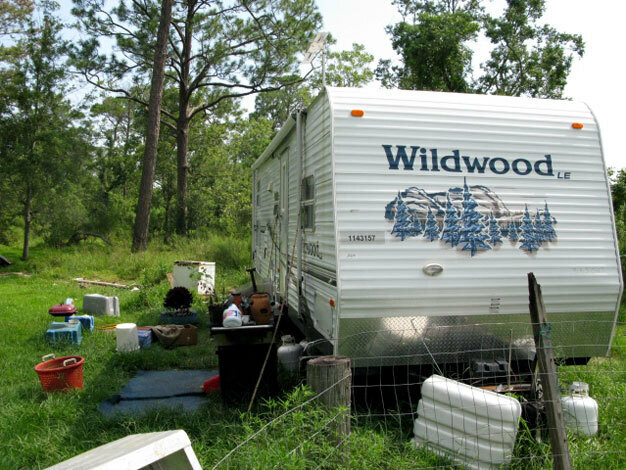 It's now against city ordinances to live in a FEMA trailer. Four years later, he says, it's time to get out. Barbour has been living in this camper for nearly four years — she's one of two Bayou La Batre residents still living in FEMA trailers despite a new city ordinance against it. Community groups are trying to raise money to build her a new home on the property. "We got guidelines, we got rules, we got regulations and we all have to follow them. That means you," he says. "And we want you to understand, we want to make you safe. And I think a lot of folks realize they don't want to go through this mess again." One of the city's two holdouts lives just a block off the water, amid the shipyards and seafood processing plants that line the bayou. Becky Barbour climbs out of her trailer to unbolt the chain-link fence around her property, as her scruffy black dog greets visitors. Sitting on the tailgate of her small pickup, Barbour says the city told her she has to be out of the trailer by the end of the month, or she may face fines and jail time. She has refused to move to Safe Harbor. "Yeah, he's trying to make me move off my land," Barbour says. "I don't have no money to go rent nothing else. I don't. I'm poor, and I don't have no money to go do that." Barbour is a small, wiry woman who appears older than her 54 years. 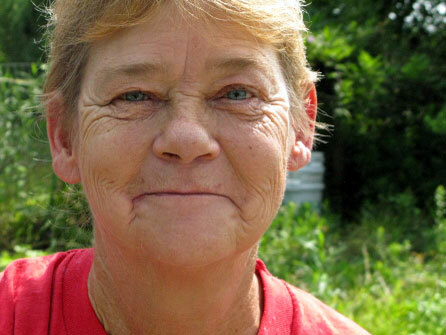 She occasionally works shucking oysters and collects aluminum cans, but mostly she survives with the help of family and friends who pay her utilities and bring food. 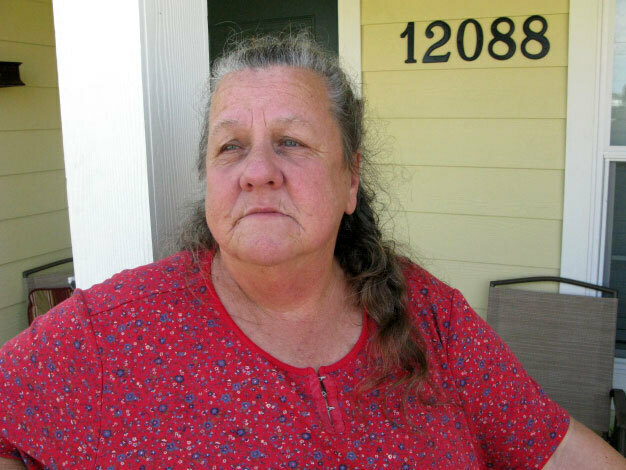 She and her husband rode out Katrina in the loft of their wood-frame house because the fuel pump went out on their truck, and they couldn't evacuate. "We lost everything; we didn't have nothing left — nothing," Barbour says. "I finally found a can of snap beans." Her husband opened the can with a pocket knife. "He'd eat one, I'd eat one," she said. And they gave some to their dogs. Her husband has died, and Barbour says the dogs and the land she's lived on for 33 years are all she has left. "I mean, this is all I got right here. I'm never going to leave here," she says. "That's the last thing my husband told me before he died — he died in that trailer right there — he said, 'Baby, don't never leave.' I'm staying right here. This is my land, and I ain't going nowhere. I'm sorry. It's just about to push me over the edge. I don't know how much more I can take." Everything would be fine, Barbour says, if people would just leave her alone.